ArtLab promotes Widening Participation and Research. The Enhancement session will introduce students to two projects running as part of ArtLab, we hope students at the intro session will generate ideas and gain an understanding of the potential of the technology, and be inspired for their own practice and contribute to existing ArtLab projects. We hope to hold further sessions throughout the academic year. Developing a Widening Participation workshop for secondary schools that encourages students to think creatively designing objects that might be needed by people who are on a planet with only a 3D printer. The idea is to find out what they need on the planet and invent new objects, that don’t exist on earth, first by making a prototype using hands-on recycled materials and littleBits electronics kits, then transferring the design into a 3D modelling program and print out using the 3D printer. We are hoping to develop a new version of the workshop, designing something to send off to the 3d printer, after prototyping it in a hands-on session with boxes, and tubes and tape and littlebits. We may need to develop our own learning resources such as an alternative introductory video, or other ways of conveying the info, to set the scene? How can we make it appeal to students at Secondary School? We hope to visit schools in the Reading area in 2016 with this workshop. SPHERE is working with clinicians, engineers, designers and social care professionals as well as members of the public to develop sensor technologies that could be used to monitor health that would be acceptable for the public to use in their homes. The sensors for health could help in a number of ways for example, predict falls and detect strokes so that help may be summoned. Analyse eating behaviour – including whether people are taking prescribed medication. SPHERE is developing a number of different sensors that will combine to build a picture of how we live in our homes. This information can then be used to spot issues that might indicate a medical or well-being problem. 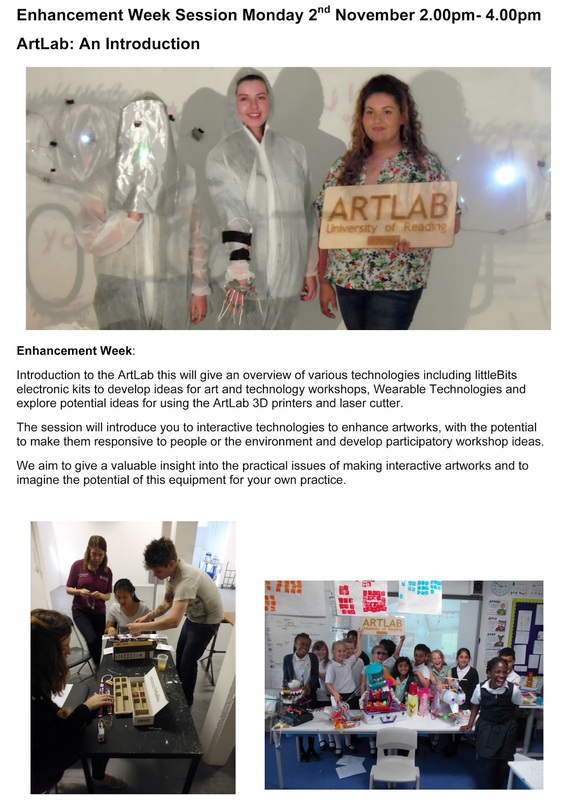 ArtLab has been invited to experiment with embedding sensors in clothing and to experiment creating ideas, designs for wearable technologies in clothes, jewellery, for health, artwork, dance, instruments, etc.